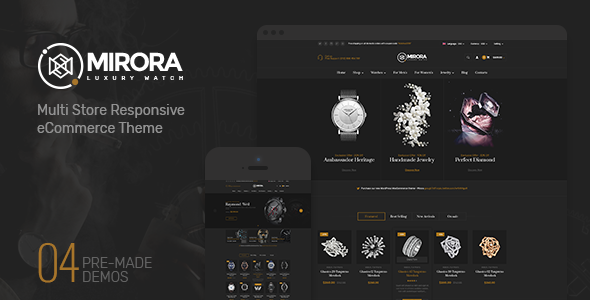 Mirora v1.1 - Watch & Luxury Store PrestaShop Theme brings luxury and high aethestic. You can easily create a professionally large slideshow in admin having a text and transition. Product Tabs Product will surely help to perfectly create multi-tabs in slider. Its mega Menu has the complete ability to create a mega menu which redirects user to Category pages, CMS pages, and any external URL via the top level/sub level menu items. Header contains social icons, topcart icon, my account, phone, logo, advertising text, search form. Footer are full links: internal links, payment.